I considered downgrading my laptop 2 months ago. I figured that the specs of my MSI Megabook Turion 64-bit laptop were overkill for me. It was underutilized. I figured that I didn't need much horsepower and features for a laptop since most of my heavy computing requirements were provided by my desktop which is my main computer. My laptop is just an extension of my computing requirements when I'm mobile. And I don't use the laptop every time I go out. So I consider it underused. And so, yesterday, I got myself the downgraded laptop I wanted. It's a Samsung Pentium 3-750. The best thing I like about it is that the docking tray (which carries a floppy drive, CD-ROM drive, 2 additional USB ports, serial & parallel port) can be detached thereby leaving the laptop with the bare essentials (20GB hard disk, USB and PCMCIA card). I'm going to use this laptop mainly for online purposes and some web developing so I don't need a DVD-ROM or a fast processor. If I need additional file space, bluetooth connections or a mouse, the USB port will suffice. 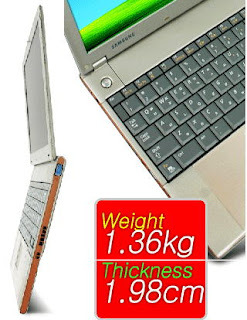 I've used this laptop before and I love it's thickness (or thinness if you ask me) and size. It's only 1.98 centimeters thick and weighs only 1.36kgs. The weird thing is that I can type faster on this keyboard than on my MSI book. One thing I love doing is accesorizing computers. Last year, I read up on modding (computer modifications to CPU cases, monitors, laptops etc...) where you change the visual elements of a boring computer and transform it into a cool and thematic machine of art. For this particular laptop, I wanted to create a fast car theme. First, I bought a Final Fantasy poster from Comic Alley for P20.00 and cut out a portion to be used as the background wallpaper for the cover. I cut out the fiery art on a dark background. Then I went to Officewarehouse and bought a clear A4 acetate for P11.00 to cover the wallpaper and make it appear shiny. I cut the A4 acetate to fit the size of the laptop and taped the ends. Next, I went to the Blade car accessories store to get an "@" symbol to stick on the bottom left and made it appear embossed. One character costs P55.00. I was looking for a "Need For Speed" sticker but they didn't have any. 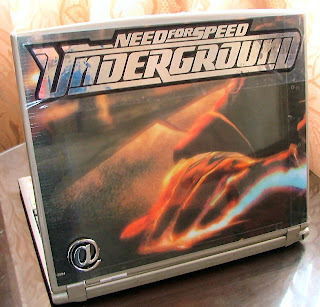 So, I proceeded to a sticker stall to have a custom-made silver sticker sporting the logo of the "Need For Speed" game to accentuate the car theme and at the same time make the laptop appear to be fast (when in fact, most of the laptops mine will stand side by side by in cafes and wifi hotspots will actually be faster). 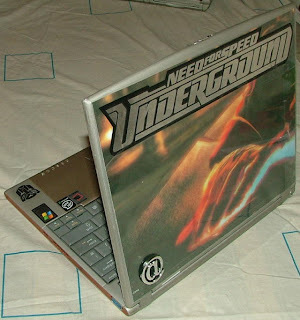 I had one made to fit the exact width of the laptop. The custom-made sticker costs P130. and took 8 minutes to make. As for all my computers, whether desktops or laptops, my trademark is adding the transformers "autobot" symbol. I usually place it at the center on the cover of my laptops but for now, I figured placing both autobot and decepticon insignias on opposite ends below the keyboard. One transformers sticker costs P30.00. Since it had the letters "Kia" on the cover which I covered up, I'm officially naming this laptop, "Kia". 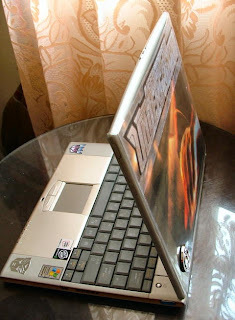 I spent a total of P276.00 to accesorize the laptop. I may add more depending on what I'd like to add. I'm tinkering on the idea of adding something to look like a "car spoiler". And so behold, 2nd hand downgraded but newly accesorized laptop, Kia. And how old are you? 16? Nope. Kinda double that. Why do you ask ? I don't think a lot of 16 year olds own a laptop. Of course, I could be wrong.